FRANKFORT, KY (WAVE) - Gov. Matt Bevin remained on the offensive on behalf of pension reform Tuesday, with remarks targeting the state teachers union. "Tell the people that are protesting, if you get what you wish for, you're going to wish you hadn't asked for it," Bevin said on TALK 104.1 FM in Bowling Green. 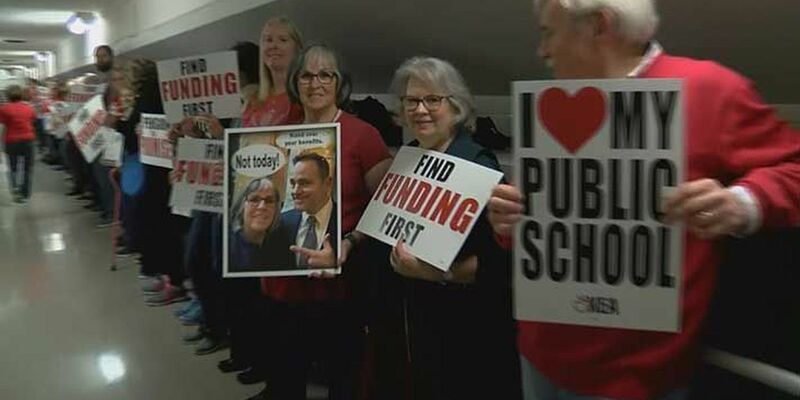 Attempting to revive his plans to enact reforms to the state pension system, Bevin accused the Kentucky Education Association (KEA) of endangering the future of the state pension system. He appealed to what he called the "silent majority" to back his plan for pension reform. "Right now, they are hearing only from the angry people who want to destroy what's good for the state," Bevin said. Criticized within his own party for recently attacking the state's teachers as "selfish" and "uninformed," Bevin made dire predictions if pension reform fails. "The fact is the system will fail if the KEA gets its wish in destroying the plan to save it," Bevin said. "It will fail and then there will be nothing." KEA President Stephanie Winkler said the teachers union is still open to dialogue. "We deal with bullies every day," Winkler said. "We know how to handle ourselves. And we're absolutely willing to talk to anybody." If pension reform is not passed, Bevin said there will be immediate consequences for local governments shouldering the burden of rising pension costs. Bevin said statewide totals would be in the hundreds of millions of dollars. Opponents actually agree with that prediction. Senate Democratic Floor Leader Sen. Ray Jones II said the crisis could be avoided if the republican dominated legislature passes a pending bill that could reduce the sudden impact on local budgets. "We need to find a way to protect our local governments," Jones said. "We need to find a way to address pension reform. But we can't destroy public education and the teaching profession in the process."